Home.prontofileconverter.com is the PUP that uses misleading techniques to prevent removal. Use Reimage to locate malicious components and get rid of them faster than with uninstall instructions. A full system scan blocks virus reappearance and prevents traffic to malicious domains. Why does Home.prontofileconverter.com search engine load in your browser? How did this potentially unwanted program find its way into your computer? Home.prontofileconverter.com virus is a shady computer pest that can hijack your web browser and diminish your browsing experience significantly. This infection arrives together with Pronto File Converter (developed by Genieo Innovation Ltd.), a tool that is advertised as the utility that helps to convert any file without leaving your browser. This suspicious application is compatible with Windows and Mac computers, and can infect all the most popular web browsers, including Google Chrome, IE, Mozilla Firefox, and Safari. It uses particular tracking technologies to spy on user’s browsing activity as he or she browses online, and might gather data such as search queries made, links and ads clicked, bookmarks added, browser type, operating system, and user’s name and IP address. Beware that user’s name and IP address is considered as personally-identifiable information. According to our study, this potentially unwanted program might conduct surveys about Genieo products and services. Be aware that by participating in these surveys and providing your personal information you reveal it to the suspicious third-party company that uses it for market research and possibly other purposes. Besides, this program might share collected personally non-identifiable information with third-parties, and based on such data generate targeted advertisements for you. This potentially unwanted program is sometimes called as Home.prontofileconverter.com redirect virus because ads it displays on the screen or integrates within the search results can cause redirects to strange third-party websites. These ads are considered untrustworthy no matter how tempting they look. Clicking on them can possibly cause rerouting to potentially insecure websites filled with unreliable content. We want to warn you that unless you are 100% sure that the Internet site is reliable, you should not download any type of software from sites accessed via the aforementioned ads or Home.prontofileconverter.com search results. Otherwise, you might contaminate your PC with untrustworthy or even harmful programs. You have to understand that content this potentially unwanted program presents is only meant to generate pay-per-click revenue, but not to be useful for the computer user. Therefore, Home.prontofileconverter.com removal should be your top priority task. If you do not know how to remove Home.prontofileconverter.com, use Reimage or similar program, or carry out instructions provided at the end of this article. Home.prontofileconverter.com hijack is an issue that can start bothering the computer user immediately after he or she installs a software package containing this parasite. This can happen after installing a download manager, free game, weather app, or similar application downloaded from the web for free. In most cases, potentially unwanted programs travel alongside free and popular software, so it is important to carefully choose the download source when you need a particular program. Besides, you can reveal and decompose software packages by selecting Custom or Advanced settings for the installation. These settings allow you to see what optional programs have been added to your download and reject them by deselecting agreements to get them. Please do not trust Default or Standard settings because they will only allow all optional programs to land on your computer system without notifying you first. If you are ready to carry out Home.prontofileconverter.com removal, then please scroll down and see removal instructions that we have prepared. If you are not an experienced PC user, you might find these instructions confusing. In such case, you can go the easy way and remove Home.prontofileconverter.com virus automatically using one of the programs listed below. Find all files related to Pronto File Converter and remove them. Also remove browser extensions related to this program. Here, look for Home.prontofileconverter.com or any other recently installed suspicious programs. 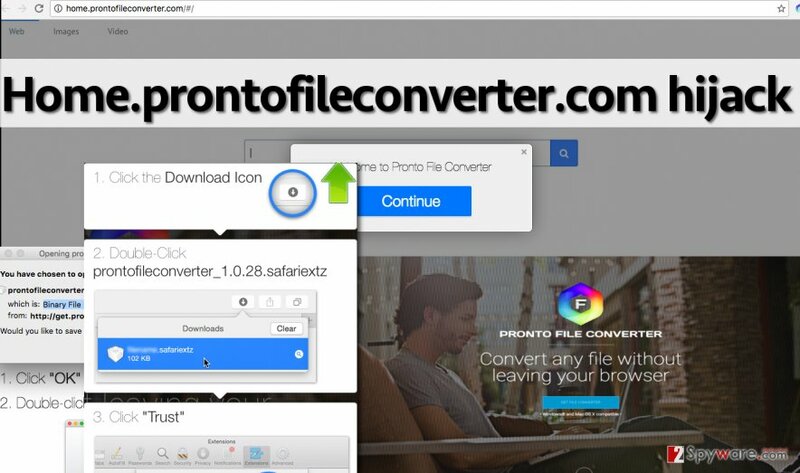 Remove Pronto File Converter from the system and also check your browsers for extensions that belong to this app. Wait until you see Applications folder and look for Home.prontofileconverter.com or any other suspicious programs on it. Now right click on every of such entries and select Move to Trash. When in the new window, check Delete personal settings and select Reset again to complete Home.prontofileconverter.com removal. Once these steps are finished, Home.prontofileconverter.com should be removed from your Microsoft Edge browser. Here, select Home.prontofileconverter.com and other questionable plugins. Click Remove to delete these entries. Now you will see Reset Firefox to its default state message with Reset Firefox button. Click this button for several times and complete Home.prontofileconverter.com removal. Here, select Home.prontofileconverter.com and other malicious plugins and select trash icon to delete these entries. Click Reset to confirm this action and complete Home.prontofileconverter.com removal. Here, select Extensions and look for Home.prontofileconverter.com or other suspicious entries. Click on the Uninstall button to get rid each of them. Here, look at the Homepage field. If it was altered by Home.prontofileconverter.com, remove unwanted link and enter the one that you want to use for your searches. Remember to include the "http://" before typing in the address of the page. Now you will see a detailed dialog window filled with reset options. All of those options are usually checked, but you can specify which of them you want to reset. Click the Reset button to complete Home.prontofileconverter.com removal process. This entry was posted on 2016-09-19 at 06:02 and is filed under Stealing programs, Viruses. You can quickly scan the QR code with your mobile device and have Home.prontofileconverter.com virus manual removal instructions right in your pocket. How did you remove Home.prontofileconverter.com virus?